Defense Ministry says the interceptor performed all phases of flight as planned, and destroyed the target. The Defense Ministry along with the US Pentagon's Missile Defense Agency (MDA) successfully test-launched the "Arrow 3" ballistic missile interceptor on Thursday morning. Several minutes after the launch, the Defense Ministry announced the interceptor had performed all phases of flight as planned, and destroyed the target. The interception itself was carried out above the Mediterranean. "This successful test is a major milestone in the development of the Arrow Weapon System and provides confidence in future Israeli capabilities to defeat the developing threats," the Defense Ministry said. "Additional Arrow-3 interceptor tests are planned in the future to demonstrate capability prior to becoming operational." The Arrow 3 is the part of Israel's multi-layered defense shield, providing the third layer of defense. 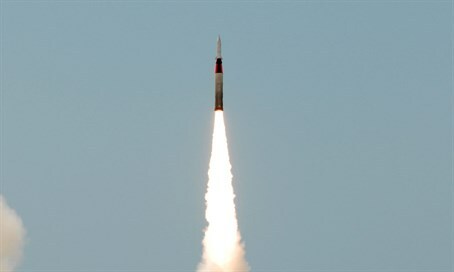 Operating in space, it is designed to intercept long-range missiles which could target Israel from thousands of kilometers away. Lower down, the David's Sling system is designed to provide protection from heavy targets like medium-to-long-range missiles, alongside heavy rockets and "suicide drones." In addition, the Iron Dome is in place to intercept short-range and medium-range rockets. This is the third trial conducted for this security system so far.